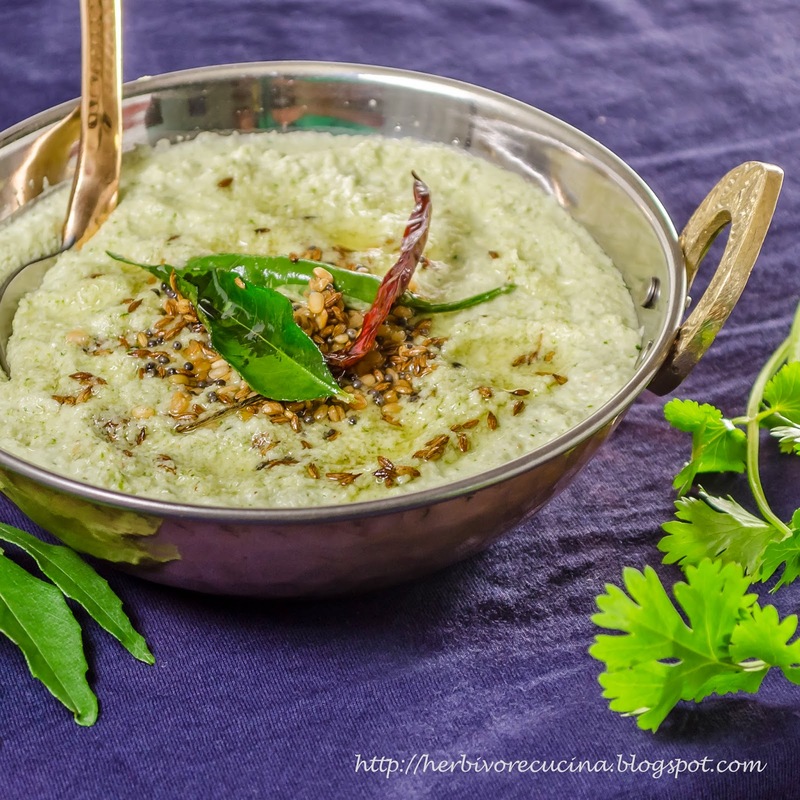 Coconut Chutney is a South Indian dip served with Dosa, Idli, Medu Vada and sometimes even with rice. The chutney appears in two consistencies: Dry and wet. The dry one is served with rice where as the wet version is served with everything else. There are various versions of this dip. The most common one has coconut, cilantro, chili, ginger and roasted chana dal. The other variations have garlic, tomatoes, red chili, sesame etc. Here is a simple recipe for the chutney. The light green tinge to it is due to green chili and cilantro. 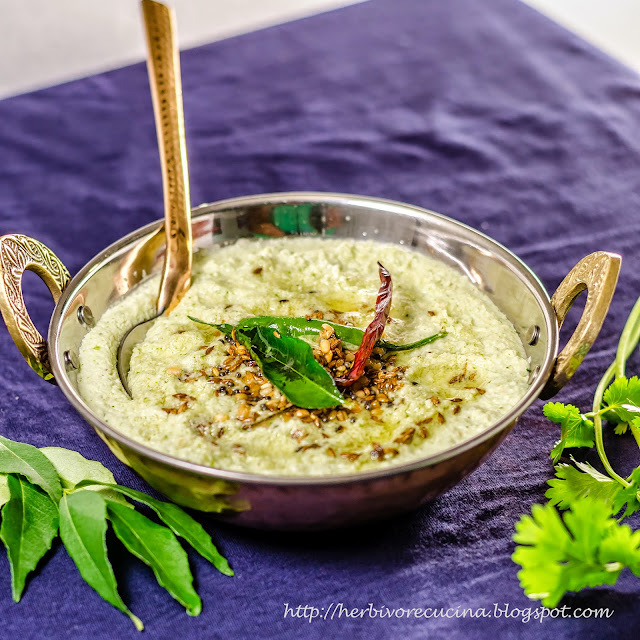 It is then tempered with mustard seeds, cumin seeds, curry leaves and urad dal. 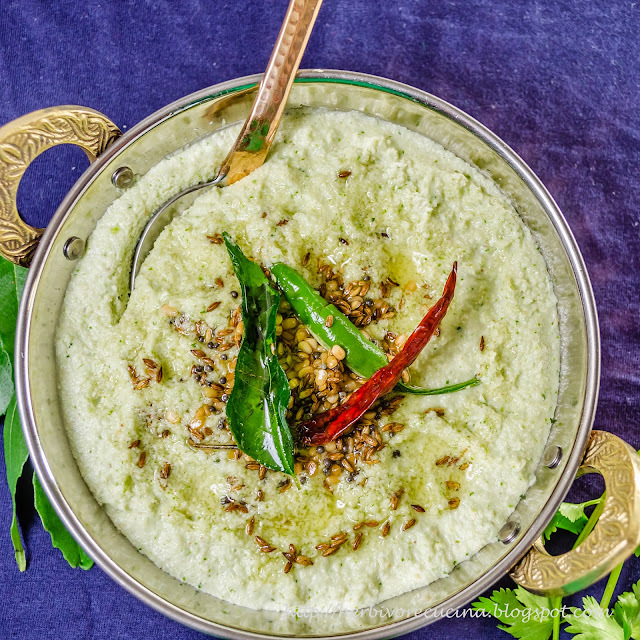 Serve with any South Indian dishes like dosa, idli or vadas. In a dry blender jar, crush the bhuna chana dal and set aside. In another jar, mix coconut, chili to taste, ginger and cilantro and blend to a smooth paste. Add salt, sugar and lime juice to taste and blend again. Use water if required. Next mix in the chana dal paste and blend to the final consistency. Remove in a container and set aside. In a wok, heat oil and add mustard seeds. Once they pop, add cumin seeds and asafoetida. Next is the Urad dal, red and green chili and curry leaves. Once it splutters, add it on top of the chutney. You can also add yogurt to the chutney to get a tangy twist. Also, garlic can be blended in with coconut and other ingredients to get a garlic chutney that goes well with Dosa and Idli. 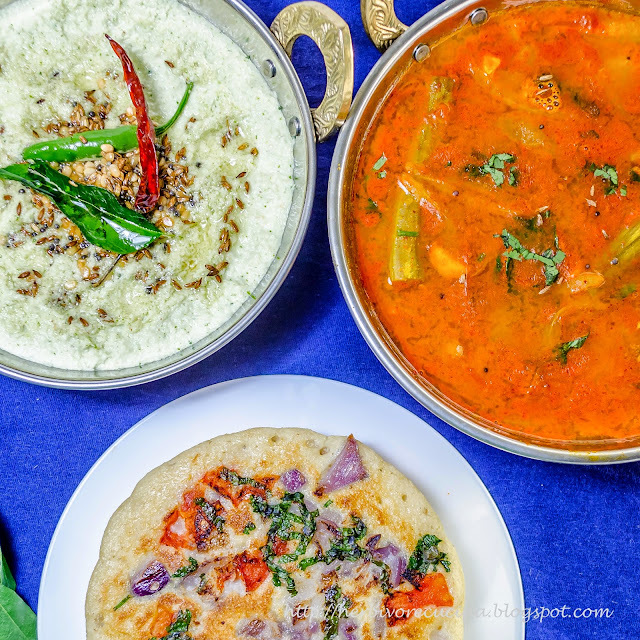 Also try the traditional Sambar to serve as a stew with any South Indian delicacy.